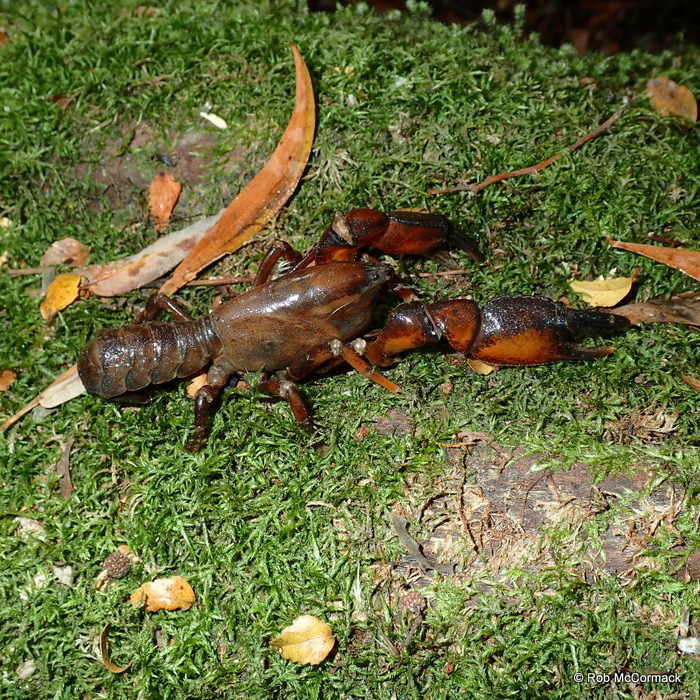 During a recent trip to Tasmania I had the pleasure of seeking some freshwater crayfish between looking at the local tourist attractions. As per Horwitz 1990 this looks like Engaeus fossor, if anyone thinks otherwise please let me know. 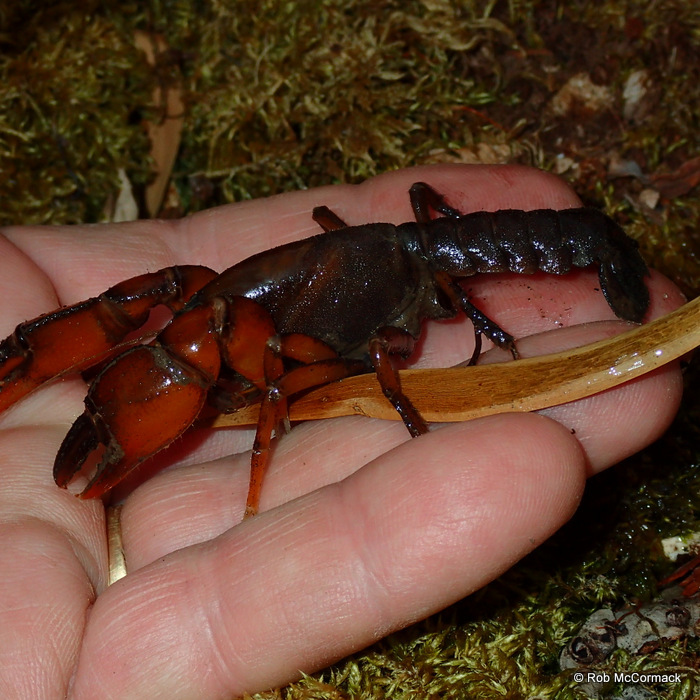 This burrowing crayfish is endemic to Tasmania, and has the widest distribution of all Tasmanian endemic Engaeus species (Horwitz 1990). 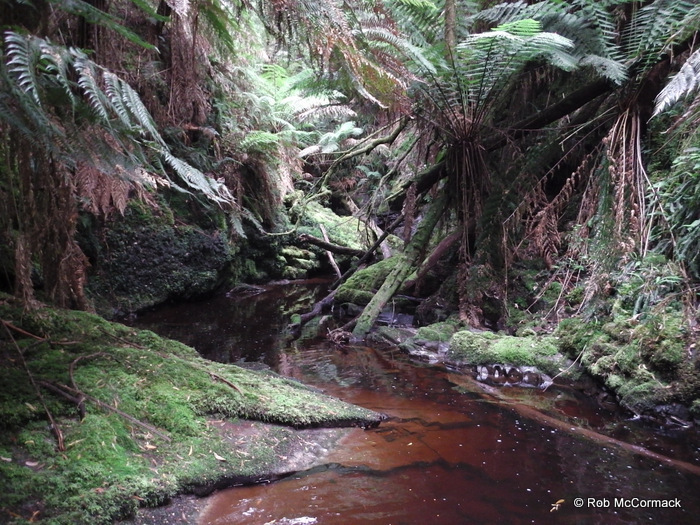 These animals are from wet swampy areas along the side of Botanical Creek in the Forest Reserve at Strahan, Tasmania. Access was gained at The Peoples Park, on the way to Hogarth Falls. 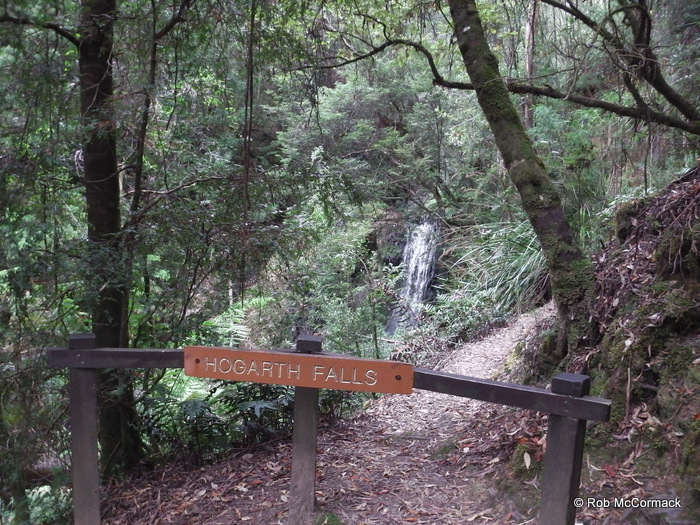 Hogarth Falls is a local tourist attraction and well worth the short walk through the reserve. 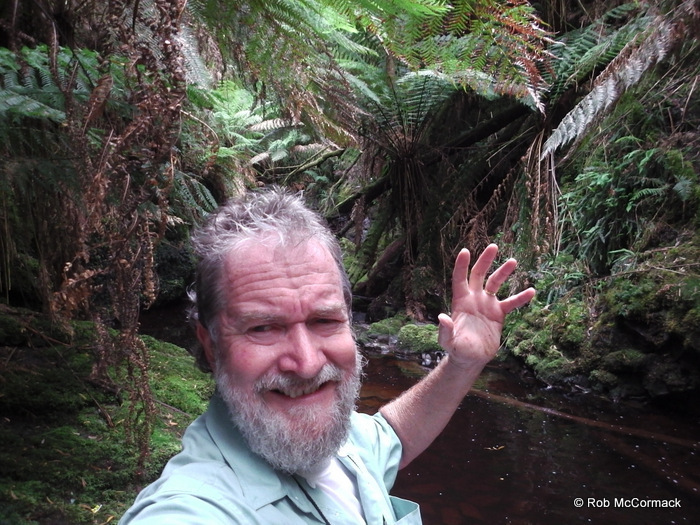 I hiked about a kilometre past the falls (about the best I could do in difficult terrain) and checked out the creek expecting to find some Astacopsis in the stream. Unfortunately, as a tourist and unprepared I just clamber down the ravine, stripped off my clothes and hopped into the stream to turn rocks. This proved less than satisfactory as the rocks were all extremely smooth and slime covered with razor sharp edges. You would step barefoot on a slimey, smooth sloping surface and slide down onto the razor edge of the next rock, anyway, after about 3 minutes I abandoned this idea as although only 1 km (took me 40 minutes) off the beaten track there was no sign that anyone had been that way in the last year so not a good place to have a whoopsie by yourself. I climbed back out of this quite nice looking stream (looking more like an albino walrus I’m sure) and tried to get my clothes back on before the leaches latched onto my more sensitive parts. In the fading light I headed back downstream to check out the Engaeus burrows I saw on the way in. 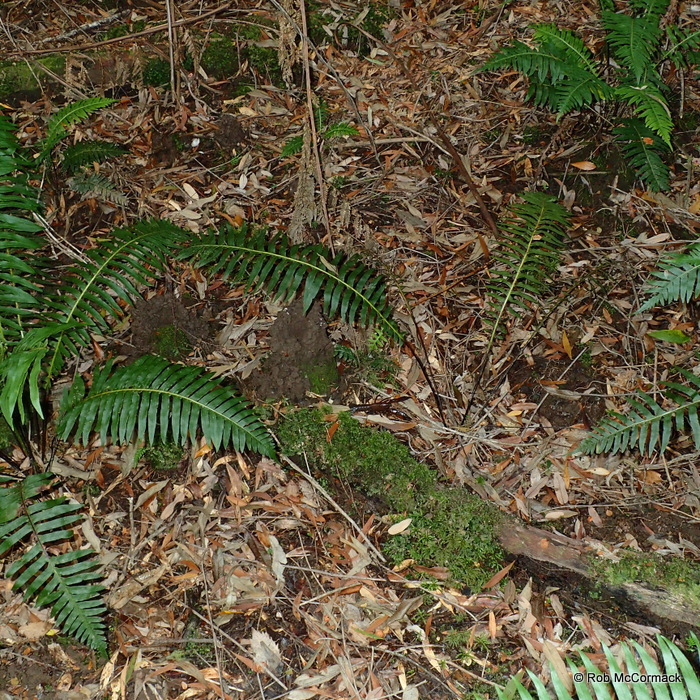 You can see burrows beside the walking track from the park to the falls in any of the wet swampy areas and sides of the creek. 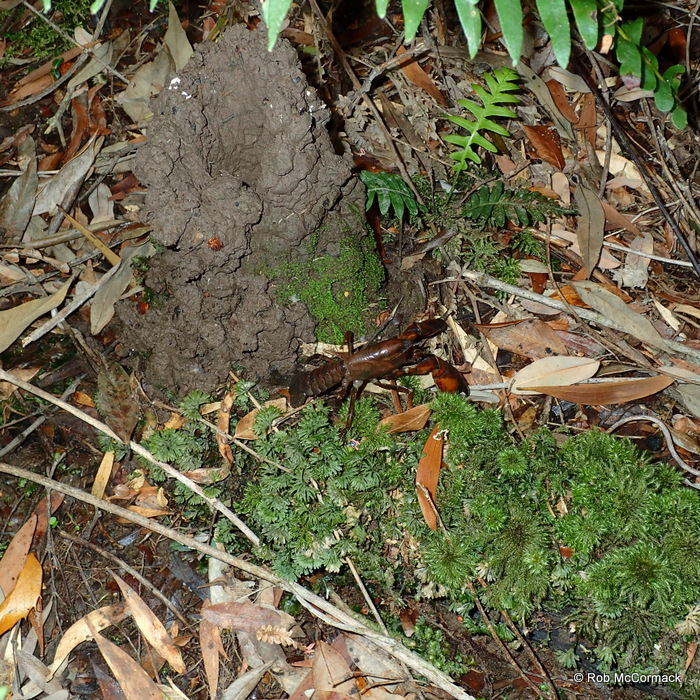 Burrows have a chimney with mud/soil stacked high in a chimney formation. The burrows have 3 to 5 surface entrances that are all connected and run parallel to the surface with a deeper burrow heading downward. 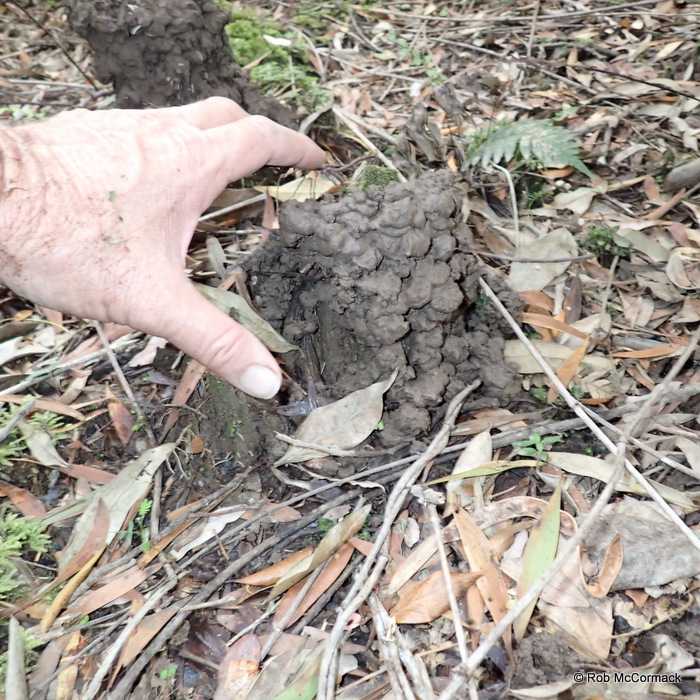 I never found the base of the burrow system so don’t know how deep they went, but over 700 mm. Burrows were into the water table that was high only 150-200mm below the surface. The specimens I collected were all captured by stealth and brute force. All specimens were captured in the soft muddy burrows by approaching the burrow quietly without vibration, and quickly cramming my hand down the burrow and along the corridors until I surprised the animal that was getting ready to defend its turf and repel invaders. If I didn’t catch them off guard and get them within the first 30 seconds they would retreat down the burrow system and disappear into the depths, never to be captured. 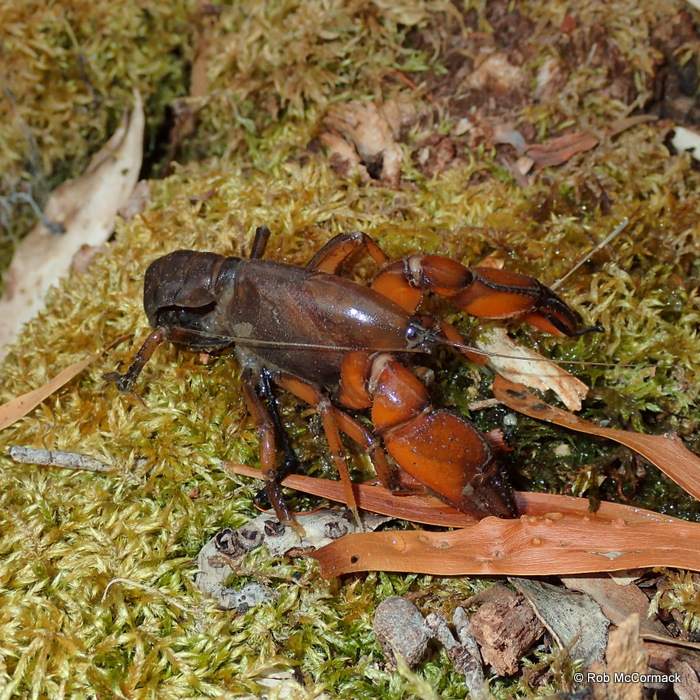 Engaeus fossor, male, 25.07 mm OCL.